Paul Goldschmidt is pistol hot in the last month. He has even had 2 Grand Slams in the last 5 days. His 3 Slash Line was .360/.423/1.123 – with 8 Taters and 29 RBI. The 25 Year Old big man from Wilmington, Delaware, also added 10 Doubles amongst his 36 Hits and 23 Runs Scored. 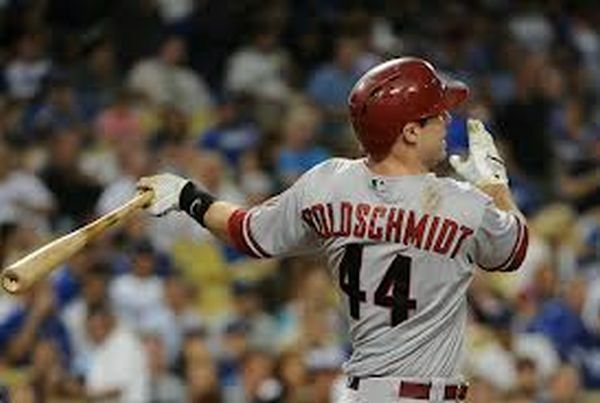 The DBacks are leading the NL West and Goldschmidt is a bonafide early NL MVP candidate thus far. He is hitting .336 for the season with 14 HRs and a NL leading 53 RBI. With apologies to Domonic Brown, (1.059 OPS, with 12 HRs and 28 RBI) and Marco Scutaro, (.398 Batting Average with 41 Hits), The MLB Reports for the NL is Paul Goldschmidt. Read the caption above to find out why. Cliff Lee edged out Mike Minor (4 – 0, 1.80 ERA), Patrick Corbin ( 5 – 0, 2.36 ERA) and Jorge De La Rosa (5 – 0, 2.36 ERA) for MLB Reports NL Pitcher of The Month. The American League Hitter of the Month was a two horse race between the 1st Monthly AL Winner Miguel Cabrera ( he has hit for an OPS of 1.114 – with 11 HRs and 29 RBI) – but he falls just short of Chris Davis. Look at the top picture to read about his brilliant 30 days stretch. The American League Pitcher of the Month was Chris Sale, who dominated in 4 Games Starts with a 0.60 ERA. He only yielded only 2 Earned Runs in 3o IP. Among his stats were only 4 Walks – while he fanned 29 Batters in those frames. 1. St. Louis Cardinals 38 – 20 – Daniel Descalso hit .405 over his last 37 AB. Matt Carpenter is red hot, with a .375 BA, 39 Hits and 23 Runs in his last 26 GP. Yadier Molina hit .374 for the last month. Carlos Beltran (19 RBI) and David Freese both hit for a .337 BA. The RedBirds had 9 Players that had over 10 RBI – including the last 5 guys mentioned up there, plus Allen Craig, Jon Jay, Pete Kozma and Matt Holliday. Adam Wainwright went 4 – 1, with a 1.83 ERA for the month. Trevor Rosenthal had a 0.00 ERA – while fanning 19 batters in 12 IP. Edward Mujica has converted 9 Saves in the 30 days stretch – and is still perfect for the year. 2. Atlanta Braves 36 -22 – Jordan Schafer hit .340 in 50 AB. Freddie Freeman raked in 25 RBI and scored 19 Runs. Brian McCann has 7 HRs and 17 RBI in his 23 GP so far. Evan Gattis clubbed 5 HRs and 14 RBI for his 53 Month AB. Justin Upton cooled off but still brought in 17 Walks. Paul Maholm went 4 – 1. In addition to Mike Minor‘s perfect 4 – 0 month, he fanned 41 guys in 40 IP. 3. Texas Rangers 35 – 22 – Adrian Beltre hit for a tune of .370, with 5 HRs, 9 2B and 18 RBI. Mitch Moreland hit 8 HRs (added with 16 XBH) while driving in 18 RBI. Nelson Cruz smacked 7 big flies in his 22 GP. David Murphy knocked in 18 RBI. Leonys Martin smacked 3 Triples and Stole 8 Bases. Elvis Andrus also swiped 8 bags and scored 20 Runs. Tanner Scheppers featured a 0.75 ERA in 12 Appearances. Derek Holland went 3 – 0, amidst his 35 SO in 31 IP. Yu Darvish K’d 39 batters in his 35.2 IP. 4. Detroit Tigers 31 – 25 – Jhonny Peralta hit a smoking .389, 35 Hits, 8 2B and scored 19 Runs. Miggy Cabrera hit 11 HRs, 29 RBI, among his 38 Hits and 20 Runs Scored. Prince Fielder smoked 8 Doubles. Max Scherzer went 3 – 0, while blowing by 37 batters in 37 IP. Anibal Sanchez Struckout 48 guys in 37.2 IP. Justin Verlander mowed down 37 hitters in 26.2 IP. Doug Fister punched out 33 dudes in 28.2 IP – and to round the Starting Rotation, Rick Porcello made 32 batters ride pine in 30.2 IP. 5. Boston Red Sox 36 – 23 – Jose Iglesias has been a great fill in with a .421 BA in 58 AB. Dustin Pedroia continues his monster season, batting .369, adding 41 Hits (11 2B) and scored 21 Runs for the last 30 days. Daniel Nava drove in 19 RBI and scored 18 Runs himself. David Ortiz hit 6 HRs and added 22 RBI – to bring his total to 39 RBI in 40 GP for 2013. Jacoby Ellsbury Stole 9 Bags. Clay Buchholz is still perfect on the season – with an 8 – 0 clip and a 1.62 ERA. 6. Cincinnati Reds 36 – 23 – Joey Votto made it on base 53 times (35 Hits and 18 BB) in 27 GP. He featured a 3 Slash of .337/.434/.983 with 25 Runs Scored. Brandon Phillips clobbered in 18 RBI and hit home plate 20 times himself. Shin-Soo Choo Walked a team high 23 times in 26 GP. Jay Bruce collected 17 XBH (9 – 2B and 8 HRs for his 23 RBI). Zack Cozart had 9 Doubles. Alfredo Simon has a 0.00 ERA in 8 APP and 14 .1 IP. Aroldis Chapman blew out the party on 24 batters in just 12 IP – and has SO 46 hitters in 26 IP in 2013. Mat Latos is still a perfect 5 – 0 on the year with a 2.90 ERA. Mike Leake went 3 – 1 with a 1.32 ERA in 5 GS. 7. Oakland Athletics 35 – 25 – Nate Freiman was the MLB Rookie of The Month – batting .351 in 14 GP. Josh Donaldson hit .350 by way of his 36 Hits in 28 GP. No one really had an outstanding month other than that. The Athletics are 15 – 4 in their last 19 GP. Grant Balfour was a perfect 8 for 8 in SVO, with a 0.83 ERA and 13 SO in 11 IP. Bartolo Colon was 3 – 1 and a 3.00 ERA (Including a CG SO last week). He threw 33.2 IP in 5 GS. 8. New York Yankees 33 – 25 – Lyle Overbay hit 8 Doubles. Jayson Nix Stole 6 Bases. Brett Gardner hit 3 Triples. Mariano Rivera Saved 10/11 Games – while sporting a 0.90 ERA. Boone Logan was perfect in carrying a 0.00 ERA in his 13 APP. Preston Claiborne continued to impress with a 0.63 ERA for 14.1 IP. David Robertson Struckout 17 guys in 14 IP. Shawn Kelley fanned 21 Batters in 11 IP. 9. Arizona DiamondBacks 33 – 25 – Eric Chavez hit .408 in the limited action he saw over the last month. Gerardo Parra hit 9 (with 34 Hits) Doubles and Scored 18 Runs. Didi Gregorius also scored 18 Runs. Heath Bell Saved 9 of out 10 chances. David Hernandez bested his previous month – by Striking out 13 batters, and fancying a 0.77 ERA in 11.2 IP. Tyler Skaggs has K’D 13 Batters in his 1st 2 GS and 11.2 IP. 10. Pittsburgh Pirates 35 – 24 – Andrew McCutchen had a month more like himself, .330 BA, 34 Hits, 8 SB and scored 18 Runs. Pedro Alvarez hit 7 HRs and drove in 18 RBI. Jason Grilli saved another 10 straight opportunities – and maintained his perfect streak to 22 Games in a row this year. Grilli has been unhittable – and fanned 22 SO in 13.2 IP. Francisco Liriano has a 2.17 ERA in 5 GS – while Striking out 39 hitters in 29 IP. Wandy Rodriguez went 4 – 1, and a 2.90 ERA. Vin Mazzaro appeared in 10 Games, 17 IP, went 2 – 0 and allowed 0 ER. Jeff Locke went 2 – 0, 1.75 ERA in 6 GS. Reliever Justin Wilson punched out 17 batters in 15 IP. 11. Baltimore Orioles 33 – 25 – Manny Machado hit .345, with 39 Hits and 14 Doubles. Nate McLouth ripped 12 Stolen Bases. 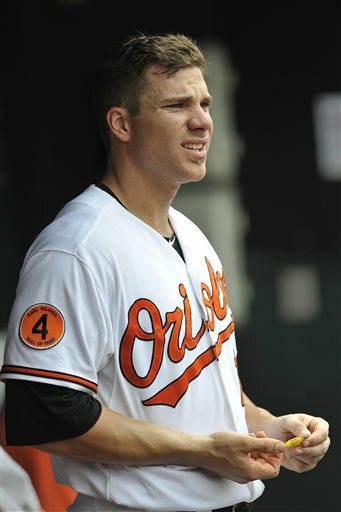 J.J. Hardy Hit 7 HRs. Adam Jones also hit 7 Home Runs, stole 5 bases with his 31 base knocks in 26 GP. Nick Markakis hit .336 for the month, with 36 hits and 8 Doubles – while driving in 18 RBI. Matt Wieters drove in 17 RBI. Chris Dickerson clobbered 4 HRs in 42 AB. The club hit 63 Doubles in his 26 GP. 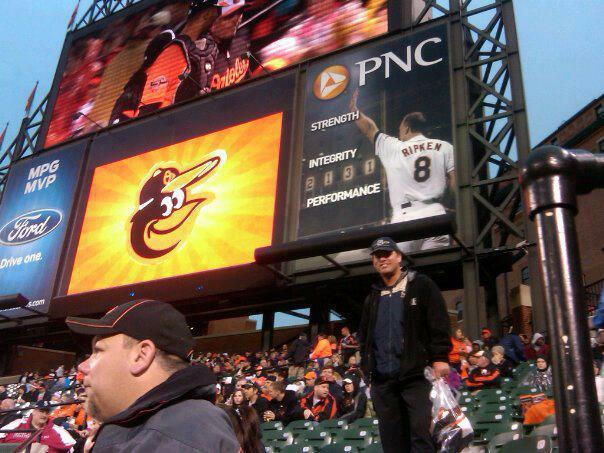 Chris Tillman got his act together for a 3 – 1 month. The club basically clubbed their way to a decent month – with most of the Pitching Staff not meeting their end of the bargain for wins. 12. Tampa Bay Rays 31 – 26 – Matt Joyce hit .329, with 4 HRs, 16 RBI and 8 Doubles in his 73 AB. Evan Longoria belted in 19 RBI and scored 19 Runs for his 34 Hits (12 = 2B and 17 XBH) in 27 GP. Kelly Johnson hit 6 HRs, and drove in 20 RBI with his 85 AB – also scoring 16 Runs. Yunel Escobar broke out of his slump – driving in 19 Runs and scoring 19 Runs (just like Longoria). Alex Cobb went 2 – 0, with a 2.45 ERA, fanning 29 Batters in 25.2 IP. Fernando Rodney did K 18 hitters in 14.2 IP, but had his struggles continue. 13. San Francisco Giants 31 – 27 – Buster Posey had 30 Hits in just 25 GP. Hunter Pence has scored 20 Runs in his last 27 GP – with also knocking around 9 Doubles. Brandon Crawford hit .327, and had 32 Hits in 27 GP. Brandon Belt smacked 9 Doubles and scored 17 Runs in 80 AB. Javier Lopez fashioned 11 straight Appearances – without allowing an ER. Jeremy Affeldt held an 0.68 ERA in 13 APP. Madison Bumgarner (39 SO in 37.1 IP) and Matt Cain (35 SO in 32.1 IP) struggled, but logged lots of Innings – and put up a bunch of Strikeouts. 14. Washington Nationals 29 – 29 – Adam LaRoche had a nice rebound month – hitting .323, 7 HRs, knocked in19 RBI and scored 17 Runs. Ryan Zimmerman had 17 RBI in 98 AB. Stephen Strasburg was 2 -1, and carried a 1.20 ERA in 5 GS. Gio Gonzalez fired 33.2 Innings of great baseball, coming in with a 2.14 ERA. Tyler Clippard was 2 – 0, with fanning 16 hitters in 11.2 IP. Jordan Zimmermann logged 43.2 IP in 6 GS, with a 2.68 ERA. 15. Colorado Rockies 31 – 28 – Michael Cuddyer came back from injury to hit .377 in 14 GP – with 3 HRs and 13 RBI. Carlos Gonzalez played the role of top fantasy baseball guy, hitting 8 HRs, 20 RBI, featuring 7 SB and 20 Runs Scored. Troy Tulowitzki continued his great play – .317 BA, with 6 HRs, 32 Hits and 17 RBI in 25 GP. Dexter Fowler has scored 18 Runs in his last 27 GP. Rex Brothers entered 12 straight games without allowing an ER. Tyler Chatwood was 2 – 1, with a 1.66 ERA in his 4 GS. In those games, he Struckout 22 batters in 21.2 IP. Adam Ottavino carried an ERA of 2.08 and fanned 14 guys in 13.2 IP. You better believe if a Pitcher has great numbers for a month in Denver – I will put them on here. These Stats mostly through games June.05/2013. 16. Philadelphia Phillies 30 – 30 – Erik Kratz has 5 HRs in hit last 53 AB. John Mayberry JR. has a BA of .348 in his last 48 AB. Ben Revere swiped 8 Bags in his last 26 GP. Jonathan Papelbon converted 6 straight saves to run his streak to 11 consecutive this year – while he yielded a 0.84 ERA in his last 30 Days, fanning 12 batter in 10.2 IP. Despite going 1 – 5, Cole Hamels K’d 37 in 35.1 IP. 17. Cleveland Indians 30 – 29 – Michael Bourn stole 7 Bases in the month. Yan Gomes has hit .333, with 4 HRs and 14 RBI during his last 51 AB. Jason Kipnis had 8 Doubles, plus 5 HRs en route to scoring 19 runs. Carlos Santana Walked 17 times – unfortunately he had a tough BA month. Asdrubal Cabrera showed signs of coming – shellacking 11 two baggers. Cody Allen retired 18 hitters via the SO in just 12.2 IP. Justin Masterson was 4 – 2, carried a 3.48 – with sitting down 44 batters in 41.1 IP by SO. Corey Kluber punched out 38 guys in 31.2 IP. Ubaldo Jimenez (33 SO in 30 IP) and Scott Kazmir (33 SO in 32) also had great hit and miss stuff in the last 30 days. 19. LA Dodgers 25 – 32 -. Skip Schumaker hit .344 in 61 AB. Adrian Gonzalez drove in 21 RBI in 26 GP. Scott Van Slyke is swinging it like his old man – with 6 HRs and 5 2B in his 54 AB on the campaign. Clayton Kershaw lugged 44.2 IP during his 7 GS, with a 2.22 ERA. J.P. Howell with a 0.69 ERA in 13 IP. Kenley Jansen K’D 21 in 12.2 IP. Hyun-Jin Ryu was 3 – 0, with a 1.61 ERA in 4 GS. 20. San Diego Padres 26 – 32 – Everth Cabrera with 14 SB (24 now for the year) and 32 Hits in 27 GP. Alexi Amarista batted .322 for the month. Luke Gregerson held a 0.87 ERA in his 11 GP. Jason Marquis went 3 – 0, and a 3.18 ERA. 21. Minnesota Twins 26 – 29 – Joe Mauer hit .369 for the Month, with 39 Hits, 10 Doubles and 22 Runs in 26 GP. Ryan Doumit clubbed 7 HRs and added 22 RBI. Justin Morneau hit .337, drove in 17 RBI on 33 Hits – despite 0 HRs. Josh Willingham had 17 RBI. Caleb Thielbar and Ryan Pressly combined for a 3 – 0 Record – and only gave up 1 ER in 24.1 IP total. Glen Perkins fanned 18 batters in 11 Frames. 23. Toronto Blue Jays 24 – 34 – Adam Lind had an under the radar .398 BA month, with 5 HRs and 8 Doubles and 17 Runs Scored in just 83 AB. Edwin Encarnacion lit it up for 8 HRs, 27 RBI, 19 Runs Scored – with his .317 Month BA. Melky Cabrera had 32 Hits (including 10 2B) in 26 GP. Jose Bautista has 13 XBH (8 2B and 5 HRs) to contribute for his 21 Runs Scored. Casey Janssen converted all 4 SVO and is a perfect 12 for 12 this year. Brett Cecil SO 17 hitters in 13.2 IP of relief work. 24. Chicago White Sox 24 – 32 – Alex Rios had 33 Hits (9 – 2B) in 26 GP. Alexei Ramirez stole 7 Bases. Adam Dunn with 7 HRs and 19 RBI with only 15 Hits and a .176 BA. Jesse Crain with 17 SO in 12 Scoreless APP – spanning 12.2 IP. Hector Santiago eliminated 29 Batters via SO in 26 IP. 25. New York Mets 22 – 33 – Marlon Byrd has 6 HRs and 16 RBI in his last 59 AB. Daniel Murphy has 11 Doubles in is ever steady play. Matt Harvey remained perfect on the year with his 1 – 0 record in 6 GS. He SO 43 in his 42.2 IP. 26. Kansas City Royals 23 – 32 – Alex Gordon hit .327 – with 35 Hits in 28 GP. Tim Collins, Greg Holland and Louis Coleman held opponents in check – for a combined 20.0 IP of scoreless ball. James Shields threw 36 IP over 5 Game Starts, yet was a tough luck pitcher. He went 0 -4 – with a 3.25 ERA. 27. Chicago Cubs 23 – 33 – Anthony Rizzo collected 9 Doubles in his last 25 GP. Alfonso Soriano with 8 Doubles in 23 GP. Starlin Castro with 8 two baggers in his 25 GP. The Starting Pitchers for the Cubbies were the story hitting for the team. They hit .309 (13 – 42) – with 4 HRs, 5 Doubles and 18 RBI. For those scoring at home, that is a .714 Slugging Percentage!! Travis Wood ( who had 2 HRs and 7 RBI in his PA for the month) – was also 3 – 1 and a 3.06 ERA. Jeff Samardzija with a 2.80 in his 5 GS – with 39 SO in 35.1 IP. 28. Milwaukee Brewers 22 – 35 – Jean Segura is providing hope for a struggling team Another nice month with a .345 BA (also leads the NL in BA still), with 40 Hits, 7 SB, 4 – Triples and 18 Runs Scored. Carlos Gomez had 8 Doubles in 27 GP. John Axford, Tyler Thornburg, Tom Gorzelanny, Francisco Rodriguez and Jim Henderson combined to only give up 3 ER in 37.2 IP out of the Bullpen. Too bad the Starters have killed them. 29. Houston Astros 21 – 38 – Matt Dominguez crushed 9 HRs an 23 RBI for the month. Chris Carter had 6 HRs and 18 RBI in 83 AB. Jose Altuve with 7 SB. Jordan Lyles and Dallas Keuchel both were aided by a lot of run support to go 3 – 1 apiece. 30. Miami Marlins 16 – 43 – Chris Coghlan hit .356 in 73 AB (and 3 Triples). Marcell Ozuna is having a great rookie campaign – adding 31 Hits (8 Doubles) in 27 GP. Jacob Turner has looked great in 2 GS so far, pitching to a 0.69 ERA in 13 IP. Ricky Nolasco SO 42 in 41 IP – over 6 GS. 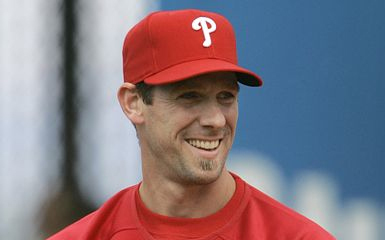 Cliff Lee has been the Phils savior thus far with Roy Halladay out – and Hamels being 2 – 9. Lee was 5 – 0 with a 1.73 ERA in his 6 GS – and 46.2 IP worth of work. He threw a CG SO and also had another start where he tossed 7 Scoreless IP. Lee fanned 40 batters in his frames – while only walking 6. Lee’s contract runs for $25 MIL from 2013 – 2015, and has a Team Option of $27.5 MIL for 2016 – or a $12.5 MIL. He is guaranteed $62.5 MIL in earnings for ’14-’15. The Record Breaking Night of Visiting 30 MLB Parks (Every Single Pitch) at Camden Yards in Baltimore in just 23 Calendar Days – April.06 -28th 2012. The Orioles won the game 10 – 1 in drizzly rain. It was Frank Robinson Bobblehead night – and the place was packed. Posted on June 6, 2013, in MLB Teams: Articles and Analysis, Players: Fantasy Baseball Articles, The Rest: Everything Baseball and tagged @chuckbooth3024 on twitter, adam dunn, adam jones, adam laroche, adam lind, adam ottavino, adam wainwright, adrian beltre, adrian gonzalez, afredo simon, al central, AL East, al mvp, AL West, albert pujols, alex cobb, alex gordon, alex ríos, alexei ramirez, alexi amarista, alfonso soriano, All 30 MLB Teams, allen craig, American league, Andrew McCutchen, anibal sanchez, anthony rizzo, arizona diamondbacks, aroldis chapman, asdrubal cabrera, Atlanta Braves, baltimore orioles, bartolo colon, ben rever, boston red sox, brandon belt, brandon crawford, brandon phillips, brett cecil, brett gardner, Brian McCann, buster poisey, caleb thielbar, carlos beltran, carlos gomez, carlos gonzalez, carlos santana, Casey Janssen, chicago cubs, chicago white sox, chris carter, chris coghlan, chris davis, chris dickerson, chris iannetta, chris sale, chris tillman, Chuck Booth. fastest 30 ballgames, cincinnati reds, clay buchholz, clayton kershaw, cleveland indians, cliff lee, Cody Allen, cole hamels, colorado rockies, dallas keuchel, Daniel Descalso, daniel murphy, daniel nava, danny farquhar, david freese, david hernandez, david riobertson, Derek Holland, detroit tigers, Dexter Fowler, didi gregorius, Domonic Brown, doug fister, dustin pefroia, Edward Mujica, edwin encarnacion, elvis andrus, eric chavez, erick aybar, erik kratz, Ernesto Frieri, evan gattis, evan longoria, everth cabrera, felix hernandez, fernando rodney, fjeff locke, francisco liriano, franisco rodriguez, freddie freeman, gerardo partta, gio gonzalez, glen perkins, grant balfour, greg holland, hector santiago, hisashi iwakuma, houston astros, howie kendrick, hunter pence, Hyun-Jin Ryu, j.p Howell, jacob turner, jacoby ellsbury, james shields, jason bay, jason grilli, jason kipnis, jason marquis, Jason Vargas, javier lopez, jay bruce, jayson nix, jean segura, jeff samardzija, Jeremy Affledt, jerome williams, jesse crain, jhonny peralta, jim henderson, joe mauer, joey votto, john mayberry, jon jay, jonathan papelbon, jordan schafer, jordan zimmermann, jorge de la rosa, jose altuve, jose bautista, Jose Iglesias, josh donaldson, josh willingham, justin masterson, justin morneau, justin upton, justin verlander, Justin Wilson, kansas city royals, kelly johnson, kendrys morales, kenley jansen, kevin jepsen, kyle seager, la angels, la dodgers, leonys martin, louis coleman, luke gregerson, lyle overbay, madison bumgarner, manny machado, marcell ozuna, Marco scutaro, mariano rivera, mark trumbo, marlon byrd, mat latosd, matt carpenter, matt dominguez, matt harvey, matt holliday, matt joyce, matt wieters, max scherzer, melky cabrera, miami marlins, michael bourn, michael cuddyer, miguel cabrera, Mike Leake, mike minor, Mike Trout, milwaukee brewers, minnesota twins, mitch morelnd, nate freiman, nate mclouth, national league, nelson cruz, new york mets, new york yankees, nick markakis, NL Central, NL east, nl mvp, nl west, oakland athletics, oaul maholm, oliver perez, Patrick Corbin, pedro alvarez, pete kozma, philadelphia phillies, pittsburgh pirates, prince fielder, raul ibanez, rick porcello, ricky nolasco, robert coello, ryan doumit, ryan pressly, ryan zimmerman, san diego padres, san francisco giants, scott downs, scott kazmir, scott van slyke, seattle mariners, Shawn Kelley, shin-soo choo, Skip Schumaker, st louis cardinals, starlin castro, stephen strasburg, tampa bay rays, tanner scheppers, texas rangers, tigers pitching staff, tim collins, tom gorzelanny, toronto blue jays, travis wood, trevor rosenthal, troy tulowitzki, tyler skaggs, tyler thornburg, ubaldo jimenez, vin mazzaro, washington nationals, yadier molina, yan gomes, yu darvish, yunel escobar, zack cozart. Bookmark the permalink. Leave a comment.